When we woke up on the 27th, Katie and I went straight to Sherwin Williams to pickup our paint. We fell in love with the light grey that we used in our office upstairs (which we’ll document in a post for you sometime) called Knitting Needles. We thought this would be the perfect color for a dark basement that needed some color without being too heavy. After getting the paint we headed back to the house and got to work. I painted while Katie peeled away at the ugly wallpaper. Let me tell you, poker chips, chess pieces, and cowboy boots are much harder to get off of walls than one would think. But it was a necessity. We used our tried and true combination of Downy and Warm Water that we posted about here. It took Katie quite a few hours to get the paper off but it worked – thank goodness. The first coat of paint was on just in time for us to head out to a family gathering. When we returned that night around 10p we got right back to work applying a second coat. I’ve always heard that you never want to plan a remodel for an event because it never goes as planned. So call it a bad move but we became determined to get the basement completed in time for our New Years Eve party. However, despite our quick progress, we still had a long way to go. 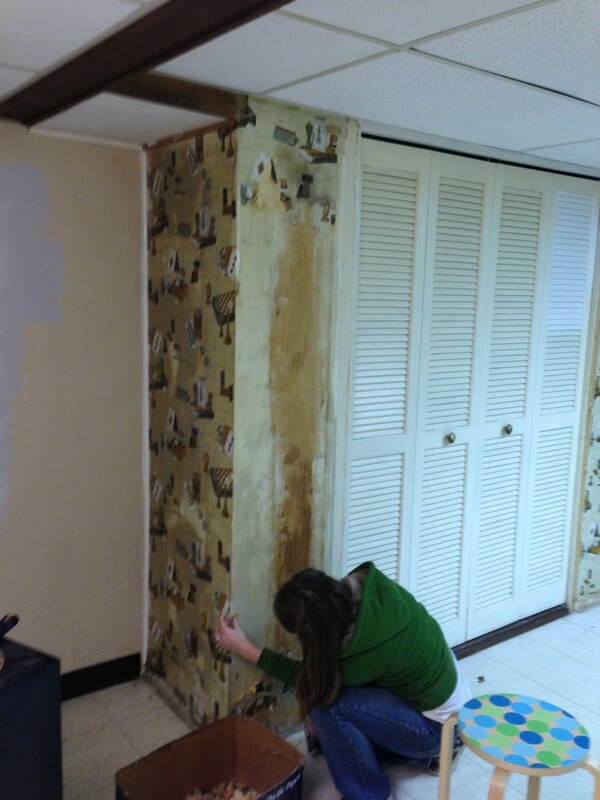 Anyone else have tricks for removing wallpaper? We have only one room left (our master bath) with wallpaper, and and all tips are appreciated! Did you get your basement done in time for your party? Perhaps 🙂 — It was a super close call. We’ll be sure to give you the lowdown in the Day 6 (New Years Eve) post.